The PokerStars.net Million Dollar Challenge is back on FOX this week, make sure you set your Tivo or DVR to tape if following the first football game on Sunday. As I've said before, make sure you tape the show after that also, just in case the game goes into OT. This week's episode will be the last chance for players to qualify for the final which airs December 27th. The final episode will consist of the weekly winners facing off against each other with a "special dealer" for that week, all playing for the right to face off against me for one million dollars. The qualifying episode on Dec 13th is unlike any of the previous weeks, but I don't want to spoil it for you as to why that is. The Bellagio WPT event is getting ready to start on December 14th. Historically I've had great results in this $15,000 buy in event, winning it in 2004, and since then coming 3rd, as well as a 14th place finish where I was chip leader with two tables left before losing with KK to AA. I'm looking forward to this event, as always, but I'm not looking forward to the new Bellagio structures which have become the worst in the country. The structure just disgusts me so much, but it's not like I'm going to skip the event because of it. I'm just so fiercely annoyed that the Bellagio went from some of the best structures in the country, then decided to just randomly make some ridiculous and laughable changes to the structures. The tournament starts with 600 big blinds which is, for lack of a better word, completely and utterly stupid, because it means taking away play at the later, more crucial stages of the tournament. I would be hard pressed to come up with a more absurd structure in this day and age for a $15,000 buy in event. Don't get me started again on the antes!!! They lowered the antes in random spots with absolutely no rhyme or reason. The old adage "If it ain't broke, don't fix it" is certainly lost on the decision makers at Bellagio. They took a good thing, and just vomited all over it. Nice job. On Poker After Dark this week, the lineup looked like this: Patrik Antonius, myself, Gus Hansen, Phil Ivey, Tom Dwan, and Phil Hellmuth. It was a cash game, and that will be the case again next week with all the players changing seats for week two. If you watched the shows this week you'd know that I booked Phil Hellmuth's action in the game. I have a lot of respect for the fact that Gus, Ivey, Durr, and Patrik play tons of hours of NL cash games on a regular basis and that my game isn't quite good enough to compete with them unless I put in a lot of hours of my own. These episodes were filmed last year, and I hadn't played enough to feel like I could compete with those guys, but I thought it would be a great challenge. Hellmuth somehow felt that despite not playing cash games regularly against anyone, that he could just walk right into this game and be a favorite. I disagree and put my money where my mouth is by booking his action in the game. With the addition of the Hellmuth book, I went from feeling like -EV to +EV. Ivey, Durr, and Patrik just play at another level. In order to compete with them you have to work very hard, play lots of hours, and study your weaknesses. I'm willing to admit they are far better than I am at no limit cash games, but I think Hellmuth actually believes he is the "best no limit hold'em player in the world by far," (his words not mine). He's either lying to the public when he makes those statements, or, he genuinely believes that. Either way, he's either lying or completely delusional. 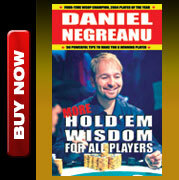 If you want to be a successful poker player that reaches the highest levels, you simply can't do that unless you are aware of your weaknesses and focus on plugging those leaks. For most people, even after doing that, they'll simply never be good enough to play at the highest levels. That's just life. You have to accept that and find a game you can beat. Most people rise to their own level of ruin by always looking to play in games they can't beat. It's part ego, part delusion, and part competitive spirit. When I sit down in NL cash game with Ivey, Durr, and Patrik, I'm not delusional in the least. It's not ego either. I can afford to play with them, and it drives my competitive juices to try and play the best I can. Change the game to an 8-game mix, and I promise you, there isn't an 8 handed lineup I wouldn't play in. There are guys I respect, obviously, but that's an area where I do have a lot of confidence in my abilities. To me, provided none of those guys are on life tilt or something, would be about the toughest lineup I could think of off the top of my head. The list is a bit different when you change the game to no limit hold'em cash games. Ivey tops both my lists, but after that, things are different. Durr makes my list for sure, as would Patrik. After that, the truth is, I haven't played enough against the other top NL players to know. I played a decent amount with those three guys last year and on this years taping of High Stakes Poker and I'm impressed by all three. I can't beat them, but I'd like to some day, maybe later in life, dedicate myself to playing more no limit cash games and seeing just how good I can get. In the meantime, my focus will be on the Bellagio WPT event. As usual, since it is a tournament and all, you can expect to see heavy doses of small ball throughout. Tournaments are just different and they require a different skill set. 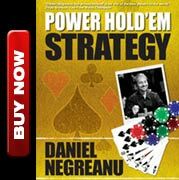 I've got a lot of experience there, and have spent lots of time thinking about the best approach to deep stacked tournament poker, and it always comes back to small ball. It's the best way to play tournaments. Period.